A uniquely small and high-performance mountable-type ODTR module for optical fiber monitoring. 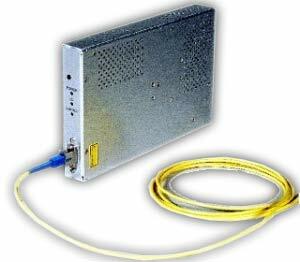 RS-232C and 10 Mbps Ethernet connections are available to read the instrument. Commands can be input externally to set up the measurement conditions, transfer the waveform data to the control unit, and read/write to files. OEM applications include loss measurement, splice and return loss measurement, and total return loss measurement.